P2PU is joining forces with littleBits to bring you a course where you will learn how to invent anything using littleBits electronic modules and P2PU-designed courseware. The course is free, online, and open to anyone who wants to participate. It is peer-powered by P2PU, and you can follow the five week curriculum starting on February 23rd or join in later if you want to go at your own pace. This course has been created to reach both those who are brand new to littleBits, as well as those with some experience points. At the end you will graduate with exclusive bitSTAR status, joining the leaders league of our community and unlocking a 20% discount. Interest-driven. You’ll work on projects of your choice that pique your curiosity. No dry videos, no quizzes. Open and participatory. Anyone can join, anyone can contribute and we create a safe space so anyone can speak. Community-powered. We’re in this together. We are always teaching and learning at the same time. Playful. We believe that you’ll learn best when you are having fun. 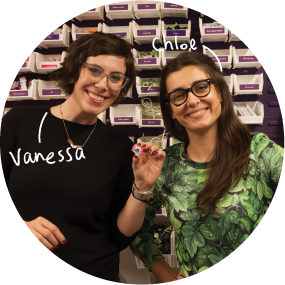 Vanessa & Chloe – your Learning Wranglers. Technology literacy : learn how hardware works and how it connects to the world around us. Community management: recruit your local crew, motivate others to join, delight your community with activities, events and support. Much of the activity is designed to encourage peer to peer learning and takes place in our online discussion forum. If you haven’t used a forum before do not fret, when you sign up for the course we will guide you through every step of it. Hangout with other bitsters during our weekly community calls every Wednesday for real-time networking and support. Each week we will also have special guests joining us for a fireside chat! Go beyond making and teach others in your local community how to #InventAnything. At the end of the course, you’ll create your own playful event using littleBits, whether in your backyard or at your local makerspace. To celebrate we will host a global make-a-thon with everyone who took the course. Sign up to receive important reminders and weekly assignments when the course starts Feb 23rd, 2015. Come introduce yourself in the forums, we are a friendly bunch. Can’t wait until February 23rd? Browse the tracks, accept a design challenge, and start inventing! During the course you will make at least two new projects from scratch. You will be invited to a weekly Community Call where you will get to work in small teams with other bitsters from around the world. We offer two different times for the calls (noon EST & 7pm EST every Wednesday) to accommodate different timezones. The course will culminate in a global make-a-thon with everyone who took the course the weekend of March 28th. All along the way, you’ll have support on our active forums from littleBits staff and other bitsters like you! You can expect to spend about 5 hours / week on projects, ideas and makery. Ask in the our forums under the “Welcome” category! *This discount is valid for a one time purchase on the littleBits website, up to $1000, and cannot be added to existing offers, such as the education discount or online promotions. The 20% discount is available upon graduation. Valid one time only. Excludes Pro Library.